What is another word for low? of the most contemptible kind; " abject cowardice"; " a low stunt to pull"; " a low- down sneak"; " his miserable treatment of his family"; " You miserable skunk! "; " a scummy rabble"; " a scurvy trick"
Sir David Alexander cecil low. 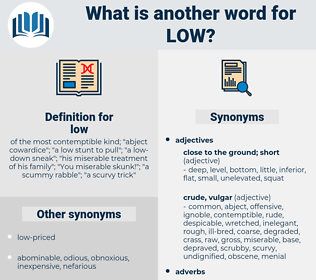 lower-, lower-level, slight, narrow, low-dollar, feeble, insignificant, scarce, low-standard, faint, scant, sluggish, slow, marginal, downward, negligible, low-growing, low-wage, low-risk, low-priced, mediocre, frail, Slumping, restricted, affordable, infrequent, substandard, tenuous, weakly, paltry, deficient, below, low-value, unimportant, disadvantaged. Narrows, directions, slow, lands, periods, fades, dive, Bas, trends, below. decreases, limitations, weaknesses, differences, downturns, bottoms, Guidelines, Publications, stockings, Animals, Downs, points, footnotes, Casualties, Foods, methods, settings, Valleys, brackets, Subsidies, trousers, SOCKS, Patches, cases, Bases, men, cuts, Bas. slow, dive, below, weakling, deregistration. sparsely, downward, slightly, marginally, relatively, weakly, below. recorded, reported, Presided, missed, edged, Chaired, Were. farrowing, Indicating, holding, lacking, flying, Occurring, exercising, remaining, Undergoing, Receiving, underlying, according, being, going, Doing, using. fallen, dipped, constrained, associated, Compared, deprived, subdued, Screwed, kept. 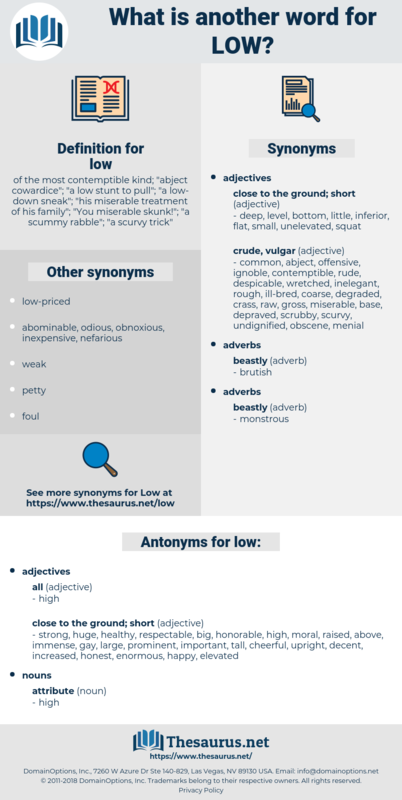 low-level, low-lying, lowly, modest, hollow, low-cost, low-income, low-altitude, low-voltage, low-grade, low-key, inexpensive, lower-income, lowest. decent, respectable, above, rich, huge, happy, honest, important, moral, healthy, raised, honorable, elevated, big, tall, strong, increased, well, cheerful, upright, prominent, enormous, immense, large, gay. good, nice, noble, polite, clean, sophisticated, kind. complex, intricate, complicated, decorated, unclear, embellished, difficult, ornate. full, great, outrageous, significant, sufficient, superior, excessive, unlimited, wealthy, worthy. competent, current, blameless, zippy, gladdened, courtly, expensive, excellent, upraised, quick, invaluable, careless, frisky, glad, ripe, grinning, irreproachable, jovial, plenteous, urbane, considerable, involved, capable, enough, piping, prohibitory, overflowing, sturdy, laughing, jocular, bounteous, liberal, mirthful, high-ticket, exultant, enlarged, content, excited, animated, civilized, virile, elegant, satisfactory, bouncing, raucous, Sprightful, thoughtful, strapping, bulky, graceful, lavish, dear, energetic, able-bodied, hopeful, statuesque, upper crust, red-blooded, smooth, expanded, living, gratified, exemplary, husky, cultured, full-blown, perky, noisy, beefy, vigorous, mod, now, lightsome, acute, notable, rangy, lanky, athletic, contemporary, inflated, teeming, jocose, latest, high-rise, stalwart, jumbo, lusty, thrilled, beaming, heartened, proud, highest, hardy, gangling, largish, outsize, estimable, ample, alive, carefree, brazen, boon, sopranino, jubilant, Peeping, jolly, polar, animate, super, harsh, tolerable, vital, cultivated, tough, hale, present-day, new, obstreperous, novel, enlightened, high-minded, muscular, pleased, encouraged, sound, considerate, modernistic, newfangled, jaunty, reputable, space age, king-size, grating, new-fashioned, stout, spendy, tasteful, sprightly, perfected, optimistic, fit, inured, uncorrupted, joyful, polished, live, screechy, rip-roaring, strident, substantial, costly, exorbitant, hard, ultraexpensive, grown, gleeful, satisfied, bountiful, merry, clarion, copious, ripened, sensitive, spirited, Overloud, smiling, pricey, dynamic, sizable, powerful, easygoing, proper, insouciant, state of the art, highbred, premium, guiltless, overjoyed, rugged, devil-may-care, Buoyed, modern, prohibitive, mature, active, thriving, jocund, strengthened, blissful, gangly, restrained, gracious, citified, springy, highborn, Dinning, adequate, well-bred, priceless, penetrating, tinny, going, toughened, hardened, luxuriant, exuberant, lighthearted, thin, stiff, seemly, running, vociferous, fortified, deluxe, sanguine, voluminous, functioning, overpriced, plentiful, temperate, mighty, crashing, brawny, up-to-date, unconcerned, Vitalized, rosy, abundant, operative, hefty, illustrious, recovering, valuable, robust, unerring, breathing, abounding, happy-go-lucky, vivacious, sinewy, matured, extravagant, cavalier, hulking, generous, precious, lively, peppy, ultramodern, delighted, oversize, upswept, incorruptible, unreasonable, discordant, luxurious.
" I want to say something to you," he said, in a low voice. Then she ran to open the door, and I could hear his low " my darling!" loyola, lah, leu, loewe, leeway, lay away, Loew, lull, leo, loyally, la, Leo Iii, LOE, Lowe, LOH, leal, laelia, loll, lulu, lh, lwei, liao, lulli, lie low, lille, law, lea, L, luo, lolo, lahu, lee, lii, loyal, lieu, lowly, ley, lao, lilo, lyly, Lo, lolly, lay, loo, le, luyia, lowell, lully, loewi, lillie, lally, lye, lie, lei, lily, lauhala, lu, liii, li, layia, Leo I.
emit, utter, let out, let loose.